Hello everyone! Here it is, week 17 already. It seems like it was only yesterday that we were packing boxes full of nothing but radishes, lettuces and micro greens, and now all of a sudden the wind is howling, the shadows are long at 10 am, Brandon’s birthday is in a week (!!!) and the annual, much-anticipated Fajita box is here! Usually the Fajita box happens near the end of September. (Last year it was Week 14!) 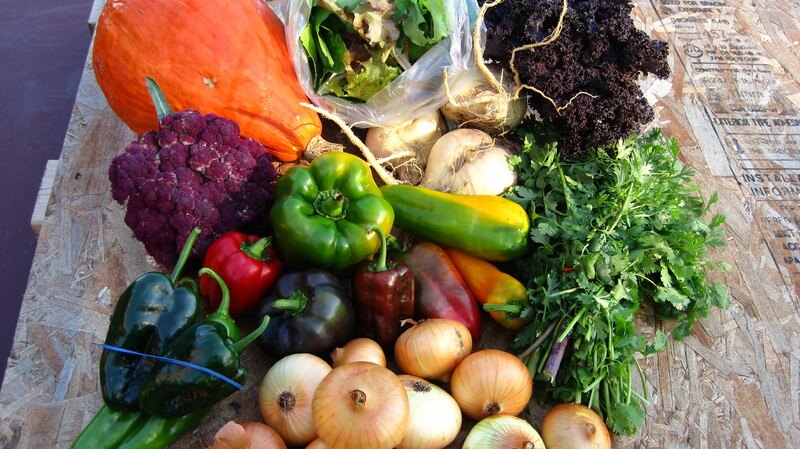 It was created as a result of the fact that the first frost historically happens when there’s still tons of beautiful ripe peppers, hot peppers and cilantro in the field which wouldn’t survive the cold temperatures. We pay lots of attention to the weather, so when we hear the “killing” frost is coming we race outside, harvest EVERYTHING that’s sensitive, and prest-o! the fajita box is born. It’s unusual for the fajita box to be this late-and if we waited for the actual frost to happen you might be getting your box in November! 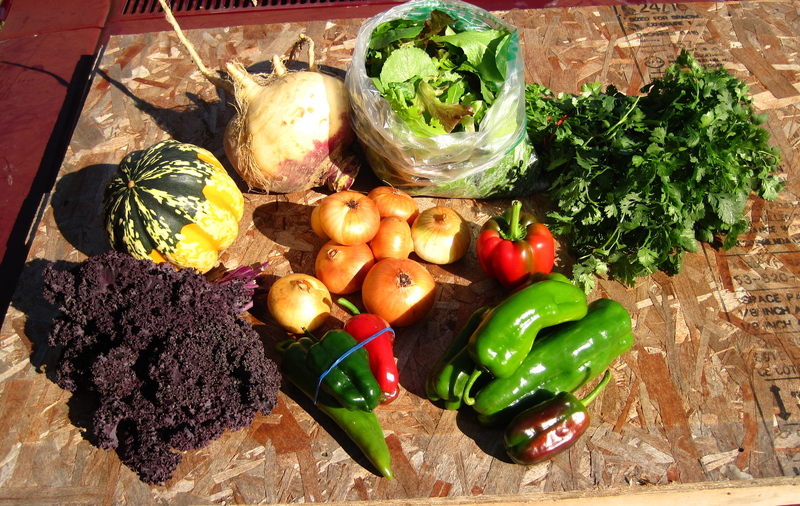 We pulled nearly 800 peppers out of the field yesterday, however, and cut the healthy, happy cilantro, trimmed the onions, and made the box anyhow, because we think it’s lots of fun. Brandon is quite skilled at making flour tortillas for our fajitas, and if you have a spare 30 minutes I’d highly encourage you to try it. It’s really not hard at all, even if the thought is a bit intimidating. Try this recipe, or visit this great blog for a highly educational and entertaining step-by-step guide on how to make this fajita essential. Whether you make your own tortillas or buy them at the store, we’ve given you a bunch of necessary goodies to make fab fajitas. At home, we often cook a bunch of black beans and rice, and simply saute the whole mess of peppers and onions together with a lot of freshly toasted and ground cumin. We go for lots of cheese and sour cream, and don’t forget the sliced chicken breast, grilled flank steak, or even Texas wild brown shrimp if you fancy a little meat in there. 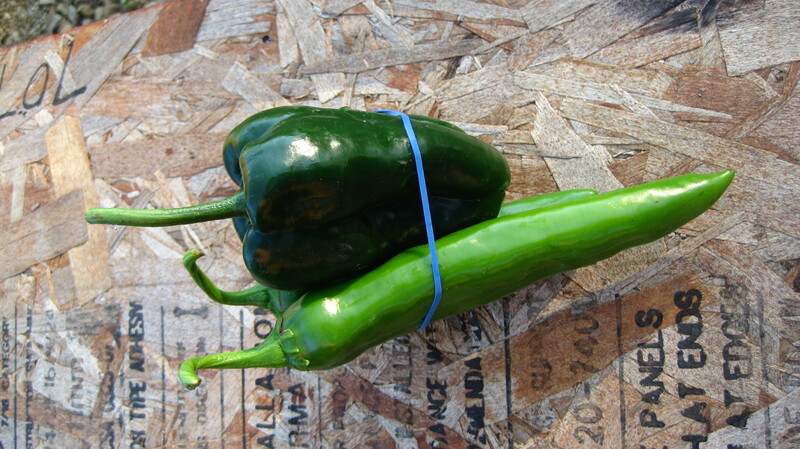 Note the rubber band around the peppers. Hopefully the band is still on there by the time you get your box unpacked, but we specifically chose the Ancho Poblano and the Anaheim peppers because they’re very distinct and fajita-perfect. The Ancho is at the top of the photo, and is distinguishable by its deep rich green color and slightly pointed cone shape. The Anaheim stands out because of its lovely bright green color and very long, tapered shape. Neither one is really that hot, but as always use a bit of caution and common sense as you cook with them. You can always taste a small slice to gauge how hot it feels to you and therefore how much to use in your cooking. One great way to handle these peppers is to roast them on the grill until they’re charred, place them in a covered bowl for a little while, peel the skins off and take the seeds out, and then slice and fold them into your fajitas, or turn them into a great enchilada sauce. 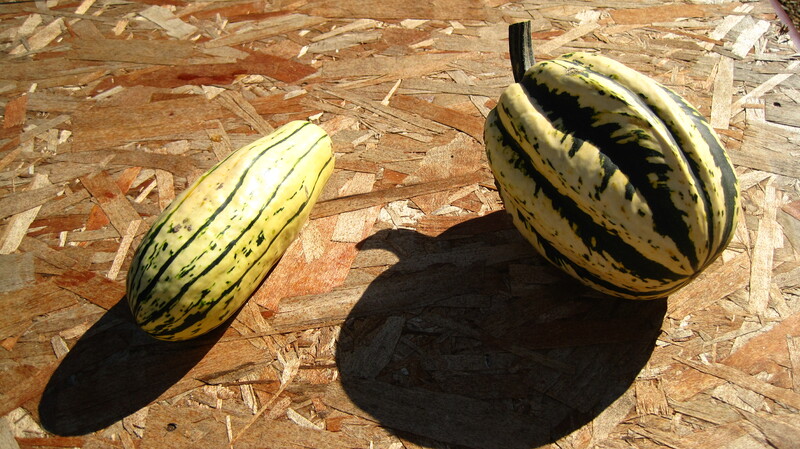 Delicata on the left, Jester on the right. Notice Jester’s adorable pumpkin-like shadow! Housekeeping note: Please Please Please remember to bring all of your boxes back to your drop sites this week and next. Since next week is the last delivery, it would be great to gather everything up by then. Those darn boxes are really expensive and if we can keep re-using them we can keep our costs (and yours!) down. Thanks so much for remembering. We love all of our members but definitely love most the ones who bring us boxes! We hope everyone is enjoying the fall and taking in the beauty of the changing seasons. 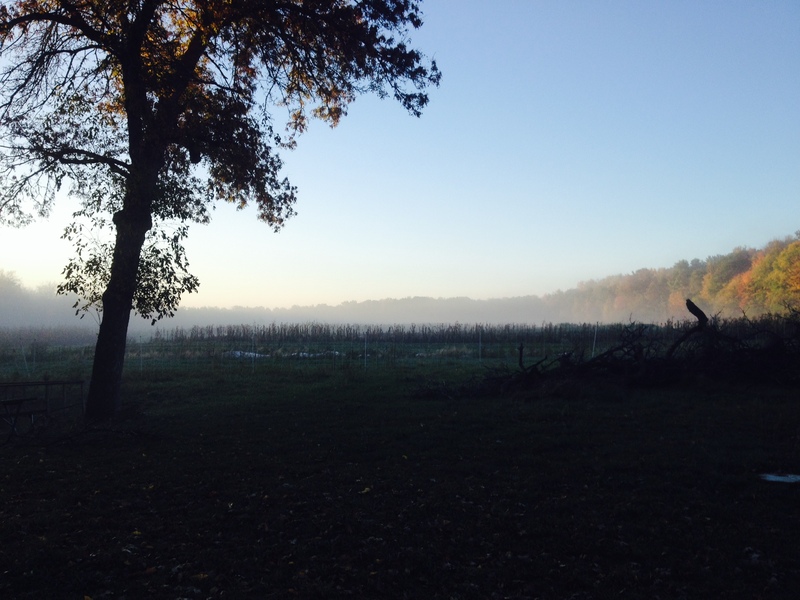 I’ll leave you with a view of the farm in the early misty morning. Enjoy!